Ever hear of "Sockless Jerry" Simpson? Of course, you have. It was not so long ago that he died at his home in Kansas, full of years, and, after a fashion, of honors. Every newspaper in the United States and Canada has made its readers’ flesh creep with the speeches of "Sockless Jerry" Simpson in Congress in the Populist cause. His name meant just what it implied. He didn’t wear socks. It wasn’t that he couldn’t. He wouldn’t. He found a pair of bare feet as useful publicity as Mr. Gandhi finds the absence of a pair of pants. How did the Hon. Mr. Simpson "that way?" That is the point of this story. Did you know that the Hon. Sockless Jerry was a schooner man before he became a corn farmer and a Congressman? That excellent historian of the Great Lakes, Capt. Edward Carus, of Manitowoc, has the facts on this. "Sockless Jerry" Simpson went sailing early on the lakes, and by 1878 had risen to the important command of the schooner J. H. Rutter, of 1,224 tons register. The Rutter was one of the few four-masters on the lakes, and one of the largest lake sailing vessels. She was 212 feet long. She had topmasts and sailed well, but she usually went in tow of a steam barge. On the last day of October, 1878, the Rutter, laden with 65,000 bushels of grain, towed out of Chicago behind the steamer V. H. Ketchum, Capt. Geo. Mallory, bound for Buffalo. It blew hard on Lake Michigan and the Rutter rolled until she shifted her cargo. She got such a list, between the shifted grain and the amount of water that came through her seams that there was no keeping her straight after the Ketchum. She wouldn’t steer. Before the walloping four-poster had twisted the stern off the steamer Capt. Mallory let go the towline. "Sockless Jerry" Simpson, left to the tender mercies of Lake Michigan, got sail on his rebellious packet and worked her in close to the piers at Ludington, on the east side of the lake, where the lee of the Big Sable Point promised shelter should the wind haul to the northward. Here, the barefoot boy gave her the anchors, lowered his yawlboat, and had himself rowed ashore. It was nine o'clock at night and pitch dark, but he routed out twenty men along the waterfront, offering them $1 an hour to come out and pump the Rutter free and trim her cargo back. He piled his shovellers on to a harbor tug and got them out and aboard, pulled his hatches off, and went to work by lantern light. The pumps had not yet sucked when the wind whipped around to the south and west and blew a gale. Here was the Rutter caught on a lee shore, out of trim, and too close in to make sail and essay the piers. Sockless Jerry gave her all the chain she had, clamped and tarpaulined his hatches, and tried to ride it out. But she walked right in to the beach with him, striking broadside on. Twenty-eight men swam and floundered from the swept decks to the shelter of the cabin and forecastle head. The surf was smoking up the beach for hundreds of yards, making a landing impossible. Before morning one huge sea burst in the side of the cabin and washed them out. So they all took to the rigging. skipper their mitts for his feet; but he would have none of that. "Let your mitts freeze on the ratlines, boys, " said he. "They don’t draw the frost like the steel wire shrouds. You’ll need all the holdfasts you can get, before we’re out of this." He was right. Fifteen hours they hung there, from long before daylight till long after dark. 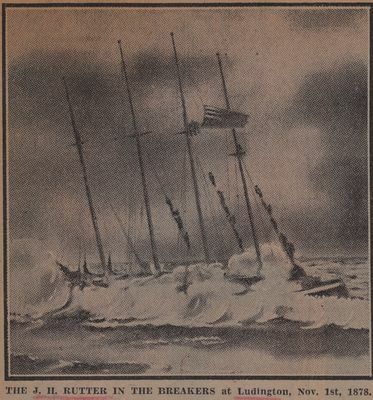 They managed to bend the signal halliards on to the American ensign when day broke, and all day it flapped above their heads, half-masted, union down, in token of distress. Five times the coastguards from Big Sable Point tried to shoot a line over the stranded ship. Five times it fell short. Four times they launched their surfboat from the beach and four times they were thrown back. A tug came out from Ludington, towing a boat on a long line, hoping to let it drift down on board the Rutter. But the seas swept it beyond reach of the men in the rigging, even had they abandoned their perches. As it was darkening down for the second night and roaring bonfires were lighted along the beach, Capt. Fred Kendrick, of the Government tug Graham, lying in Ludington, took the coastguards’ surfboat in tow, and made a last effort. Capt. L. H. Stirling took the tug’s wheel; Capt. Kendrick watched the towline. The Graham worked inside the Rutter, between her and the beach, and at the right moment the surfboat was let go. The coastguards, pulling like blazes in a smooth, managed to hook on to the laden shrouds and got a dozen men off the mizzenmast. Then they beat it for harbor and hot blankets. Capt. Stirling worked the Graham up until her stem was grinding the Rutter’s shoreward side, holding her there with the engines, until every man had been dragged safely aboard. Then the Graham, too, swung for the piers. The thermometer took a nosedive that night. Next morning the Rutter was like an iceberg with four spires. "Sockless Jerry" Simpson lost neither ship, nor man, nor toe, though his feet had a close call from amputation for frostbite. The Rutter was floated when the gale broke. She remained in service on the lakes for years. In 1898 she was taken to the Atlantic coast, to become a coal barge. She met her fate off the Virginia capes, foundering in tow, early in this century. Capt. Kendrick, of the Graham, was given a gold medal for what he accomplished, and Capt. Stirling was presented with a pair of marine glasses by the people of Ludington. "Sockless Jerry" became a hero also by the episode. He was always fond of sitting in tug offices and ship chandlery places, where he would argue by the hour on politics, and this adventure secured him larger audiences and more practise. A few years after his Ludington experience he announced that he was through with the lakes and making money for owners. He was going to make some for himself. He went to Kansas and bought a farm. But he could not give up arguing, and before long he argued himself and his lack of socks into Congress, on the Populist ticket. THE J. H. RUTTER IN THE BREAKERS at Ludington, Nov. 1st, 1878. Simpson, Jerry ; Mallory, George ; Kendrick, Fred ; Stirling, L. H.